Shabu Restaurant in North Quincy offers hot-pot cooking with a wide variety of flavors and possibilities. It’s that time of year. In the icy belly of another frigid New England winter, comfort foods are adding extra layers to a different kind of belly. 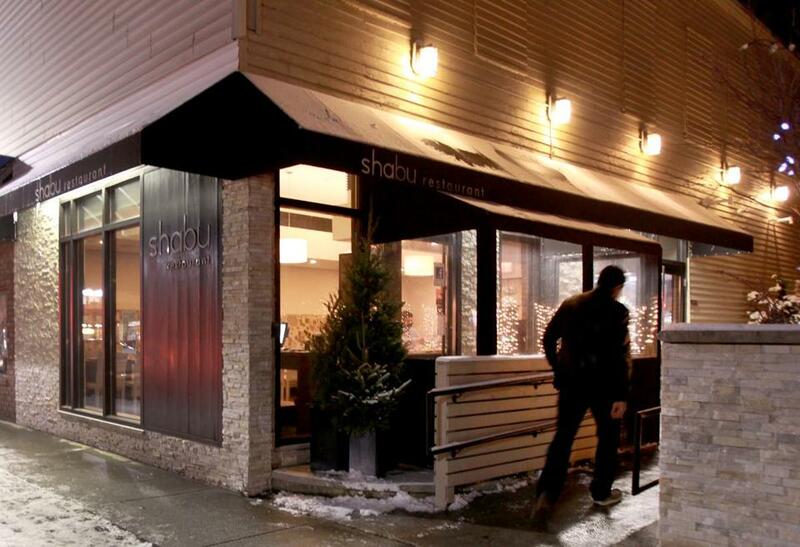 But Shabu Restaurant in North Quincy offers all the warmth and flavor of a hearty indulgence, minus the calories. Here’s how it works: You cook your own thin-sliced meats, fresh seafood, and raw vegetables by dunking them in a pot of boiling soup at your very own table. This method of cooking is healthy because you consume only the natural oils and fats of each food item and the hot broth lifts some of the fats and oils out, leaving the already lean meats even leaner. And since it’s cooked in broth, nothing dries out (as long as you don’t leave it in too long). The small restaurant is modern but cozy, with squishy booth seats lined along tables for two or four. There’s also a low bar, and an outdoor patio where you can enjoy hot pot in a Japanese garden (closed during these slushier months). We started off with the scallion pancake ($4.50) and steamed clams with sukiyaki sauce ($7). The scallion pancake, thin and crispy on the outside and tender and potato-y on the inside, definitely fit the bill for comfort food, and the clams were warm, in a light salty and sweet sauce, with a spicy kick, and awakened the senses for what was coming next. Our soups arrived quickly (a divided hot pot allows for two different kinds). We opted for the traditional miso and tom yum (hot and sour with more than a hint of lime). Other flavors include spicy Szechwan, beef and tomato, herbal goji berry, and salmon with cilantro and ginger ($3 to $6 each) and all are free of monosodium glutamate. Meats and fish come a la carte or in combo platters that include assorted vegetables and a choice of noodles or rice. We tried the sirloin beef combo ($13.75) and the surf and turf combo ($17.75), which comes with salmon, white fish, scallops, shrimp, fish cake, cuttlefish balls, clams, as well as a choice of two meats — we went with the pork and lamb. The already eclectic meal quickly became dynamic. With four house sauces — freshly minced garlic, hot peppers, scallion, and a smoky satay barbecue — the flavor combinations are infinite. Two plates each with a substantial mound of fresh veggies included green leaf lettuce, tomato, and corn on the cob as well as some I’d never tried before: a choy (lettuce with a crisp stalk and tender leaves), enoki mushroom, taro, daikon (mild-flavored white radish), and black fungus (ear-shaped mushroom with a fruit-like texture). All arrived fresh and crisp and cooked up even better. The sirloin took as little as 10 seconds submerged in the broth to cook. Firmer veggies took about a minute to get tender, but the leafy ones were just right after 15 seconds. The fish was the trickiest, with different pieces taking one to two minutes. As each piece of meat or vegetable cooked, it enriched the broth with its own flavor, making for a tasty hodgepodge, evolving with each swish through the soup. When all the bits are gone, you can ladle the remaining soup (by now, your own creation) over sticky rice or tender udon noodles. We topped off the warm, savory meal with creamy green tea and red bean fried ice creams ($5), which also come in ginger, mango, coconut, sesame, and vanilla. A full wine and beer menu includes a couple of Japanese brews, as well as plenty of hot and chilled sake options. There are also 21 flavors of smoothies ranging from watermelon and red bean to avocado and milk tea ($4, plus 50 cents for boba). The interactive nature of the meal makes for a lively, and at times humorous, experience. Don’t let the slushy sidewalks keep you from this comfort fare. Anne Steele can be reached at steele.anne.m@gmail.com.